One of the best tips for food in Singapore is to join a queue! Singaporeans love to queue for everything. From Tim Ho Wan, Nam Nam Noodle Bar, Itacho Sushi, Saveur, Ramen Keisuke, Ah Chew's desserts and McDonalds during their Hello Kitty Promotions. We just love queuing! To expand this list, I would like to recommend Golf ball size fishballs at a humble hawker store. 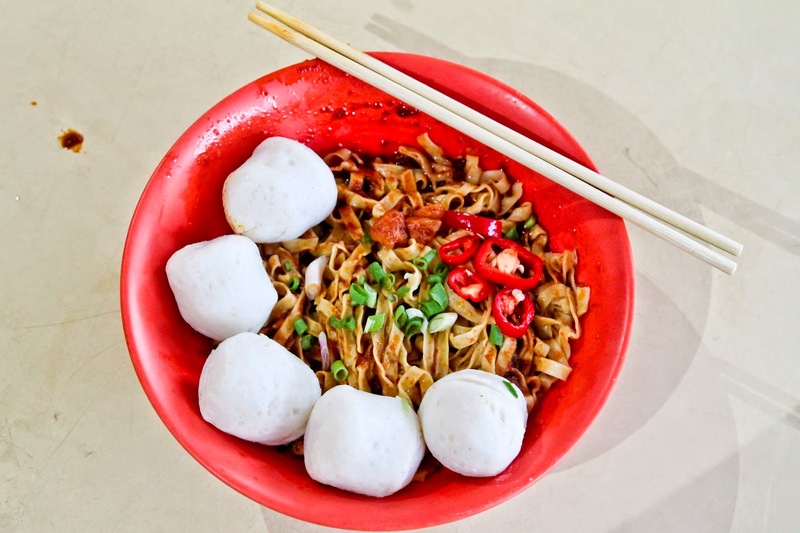 Chao Zhou Fishball Noodles has one of Singapore's best fishballs. They use yellow tail fish and kept in chilled cold water but never frozen. They have five branches (25/05/14) with four in food courts around Singapore and their humble store at Toa Payoh Lor 7. 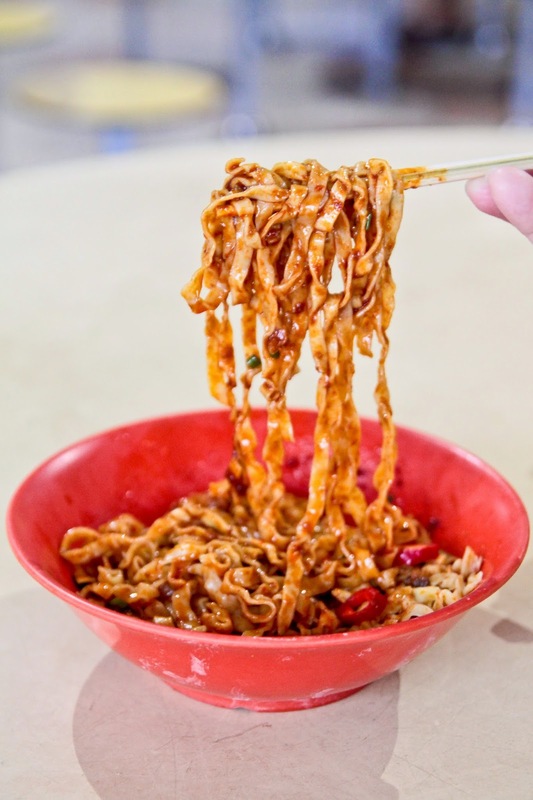 Take note that a bowl of noodles at Orchard Ion Food Gallery cost $5 while the branch at Toa Payoh Lor 7 costs $3. You will have to queue approximately 30 minutes during peak hours for a bowl of noodles. 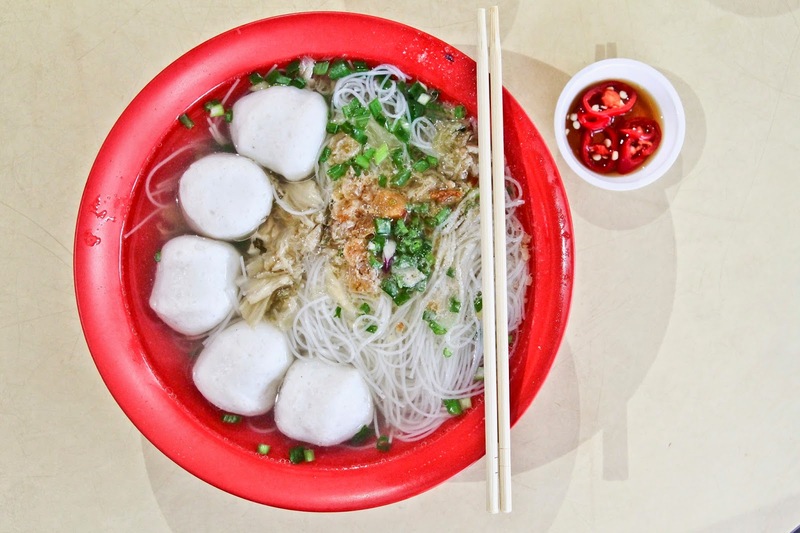 The fishballs are fresh, bouncy and juicy. Additional fishballs at 40 cents each. A sinful tip is to ask for more pork lard. ;) They fry their own lard which is crispy and flavourful. You will have to queue for your noodles. 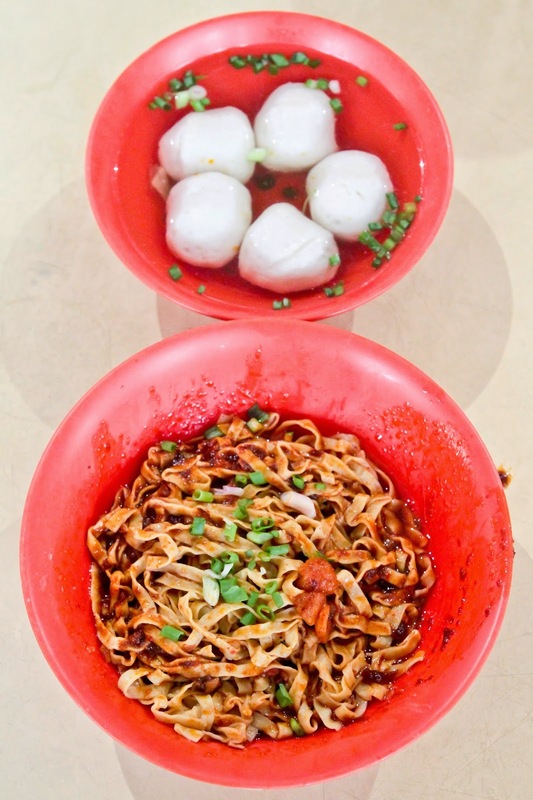 Each bowl of noodles cost $3 and includes 5 golf ball size fishballs. The fish balls are huge and extremely springy. The dry version calls for a mixture of chilli and ketchup sauce which is savoury. The pork lard lends an incredible flavour to the noodles. However, the noodles were a little salty for my palate. Do take note that if you are used to having a low sodium intake, you may want to cut back on the chilli sauce. The fishballs will be served in a bowl of soup. The noodles are mixed in that savoury sauce. They do offer soup versions. As aforementioned, if you prefer less salt in your food, request for less Dong Cai. 冬菜 (Dong Cai) which is preserved cabbage preserved in garlic and salt. It is of course extremely salty. 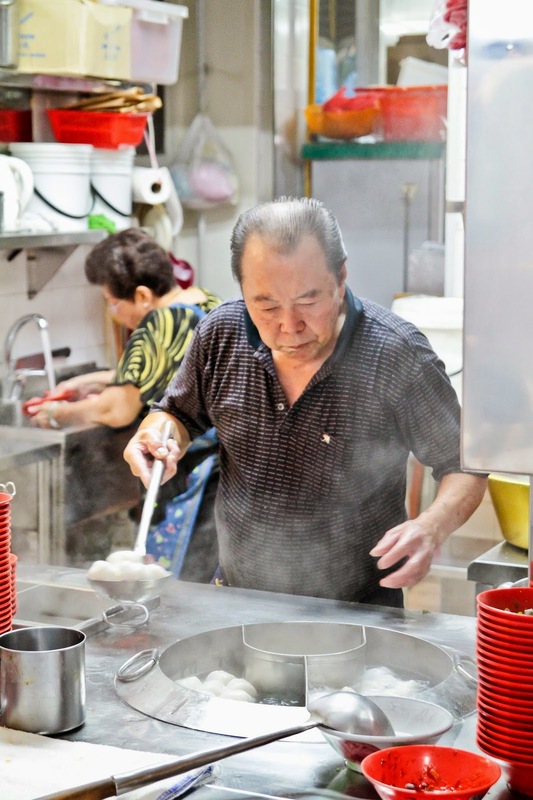 The man who uses his finger to test the doneness of the fishballs and noodles. Lard has been used in place of butter till vegetable oils were made more common and more affordable. Lard is mainly fats and in chemistry or biology is known as Triglycerides. Triglycerdies composed of three fatty acids and the distribution of fatty acids varies from oil to oil (Thomas, 2002). However, our fear for lard has often been credited to Shortening, the synthetic substitute for lard. Crisco introduced Shortening in 1911 as a substitute for Lard. Shortening was designed in a lab and its parent company, Procter & Gamble (P&G) launched an ad campaign that made people think about the horrible stories of lard. In 1950s, researchers found correlations between animal fat in the diet to coronary heart disease. The research findings led us to our fear for Lard. Only recently did nutritionists start to soften their views on saturated fats like lard as long as it is taken in moderation. Lard is high in monounsaturated fats (45% of cooking fat (USDA,1979)), which is associated to a decreased risk of heart, as compared to butter (21% of cooking fat (USDA,2010)). Lard is far more superior to butter for making biscuits and cookies. Butter melts (150°C) before the oven's heat can set a biscuit or cookie mixture, which allows the cooking item to spread. Solid animal fat (190°C) does not prematurely render, resulting in taller and more visually inviting biscuits and cookies (Hillman, 2002). Try a pie crust made of lard and you know that it is extremely, delicious. 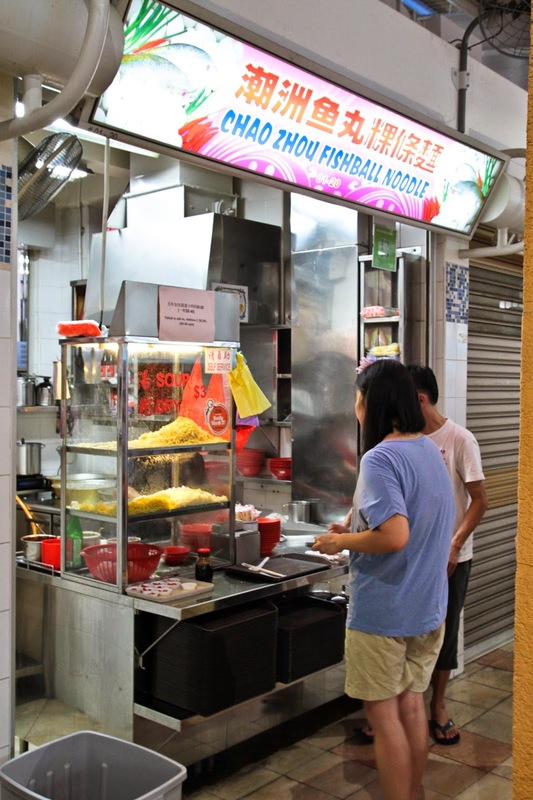 - Take note that the Toa Payoh Lor 7 branch only opens four times a week. They have other outlets that cook their noodles daily but are more expensive. - The fishballs are soft, bouncy and succulent. - Their crispy lard is amazing. - Hillman. H (2002), The New Kitchen Science: A Guide to Knowing the Hows and Whys for Fun and Success in the Kitchen. Pg (211). - Thomas. A (2002), Fats and Fatty Oils: "Ullmann's Encyclopedia of Industrial Chemistry", Weinheim; Wiley-VCH, ISBN 3-527-30673-0.